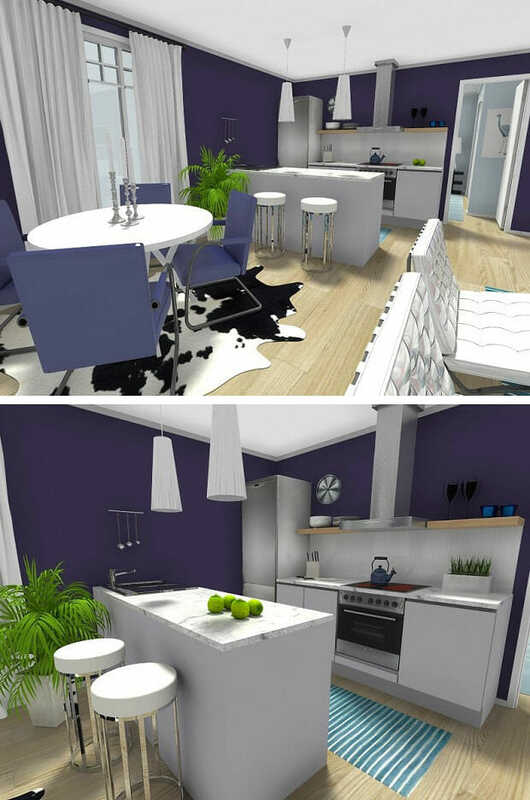 Are YOU ready to “up” your interior design and decorating game with 3D interior design presentations? Creating good interior design presentations for clients has always been one of the most important and time-consuming tasks that designers do. Clearly illustrating your design ideas is critical to enable your clients to visualize the space, the design, and their options. When done effectively, clients are then better able to see the value of the design and make the decisions necessary to make the design a reality. The first step in preparing an interior design presentation is to create drawings and images of your design proposals. Typically this starts with a basic 2D floor plan to show the project layout. However, many clients find floor plans hard to read. Adding some color, texture or shadowing to the floor plan can help but, hand-rendering adds an extra step to preparation time. Along with preparing floor and furniture plans, a selection of finish samples, fixtures catalogs, and furniture images are laid out for clients to choose from. While many clients are able to select finishes and items they like, they struggle to visualize them in the space. Creating additional perspective drawings or sketches help to illustrate the room design in 3D but, creating good perspective drawings is both a challenge and time-consuming. In addition, new technologies such as 3D CAD software, movies, computer games, and even children’s cartoons have dramatically changed the visual landscape as well as our visual expectations. Design customers have come to expect 3D visualizations for their home design projects without realizing the time and cost involved in producing them. The majority of interior designers and decorators are small businesses with limited resources and project budgets. How can you stay competitive and still create design presentations that will impress your clients in a time and cost-effective way? 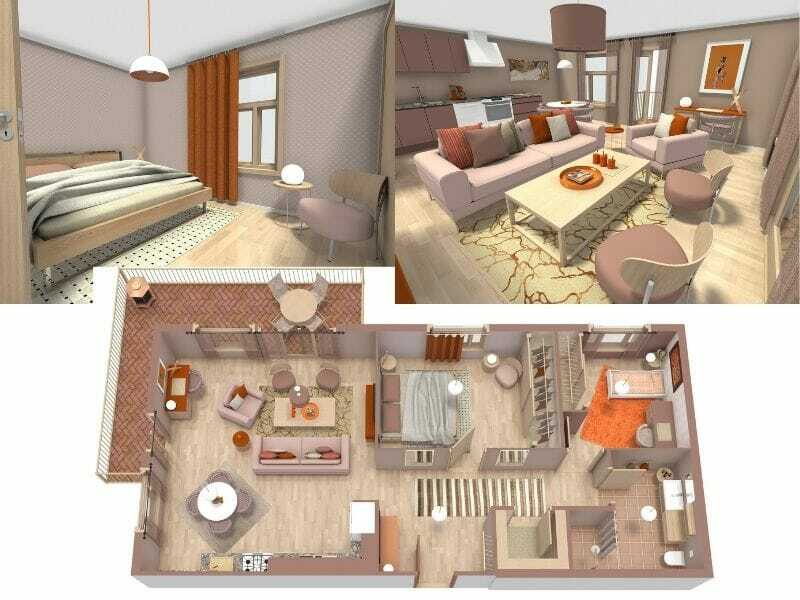 RoomSketcher Home Designer is an easy-to-use home design and floor plan software that you can use to plan and visualize interior design projects online. With a RoomSketcher Pro subscription, you can generate sophisticated 3D interior design presentations – quickly, easily and affordably. Unlike other 3D home design software, RoomSketcher Home Designer is easy-to-use – not technical training is required. So, you can get started straight away. Draw your project floor plan in minutes. Then, furnish and decorate your floor plan with fixtures, finishes, and furniture from the RoomSketcher Product Library, which contains more than 5,000 brand-name and generic items. While you draw, a virtual 3D model of your floor plan is generated. Once your floor plan is complete, the RoomSketcher state-of-the-art rendering and 3D visualization technology allows you to see your interior design project in 3D at the click of a button. 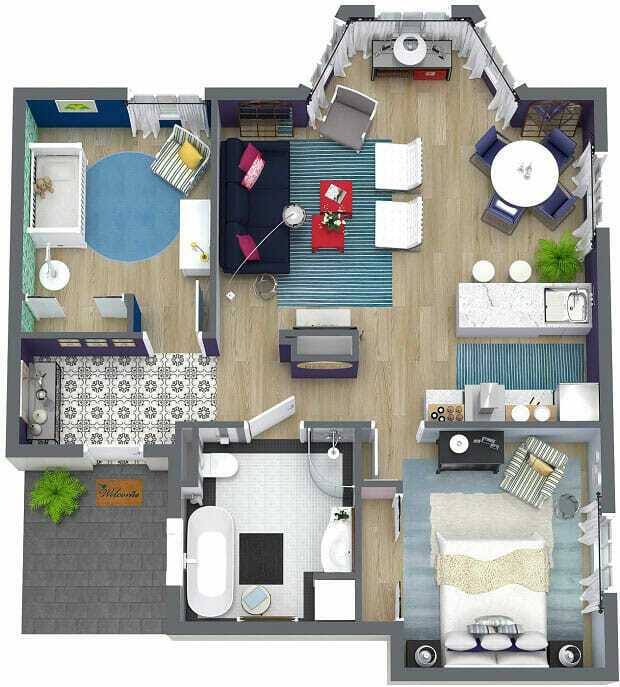 Present your interior design and decorating ideas with clear high-quality 3D Floor Plans either on-screen or download a high-resolution image to print out. RoomSketcher 3D Floor Plans allow your clients to easily visualize the space, options and the potential of your designs. An easy-to-use camera tool lets you take 3D Snapshots of any part of your design as if you were standing in the room. Create and save multiple snapshots to compare and present different design options. 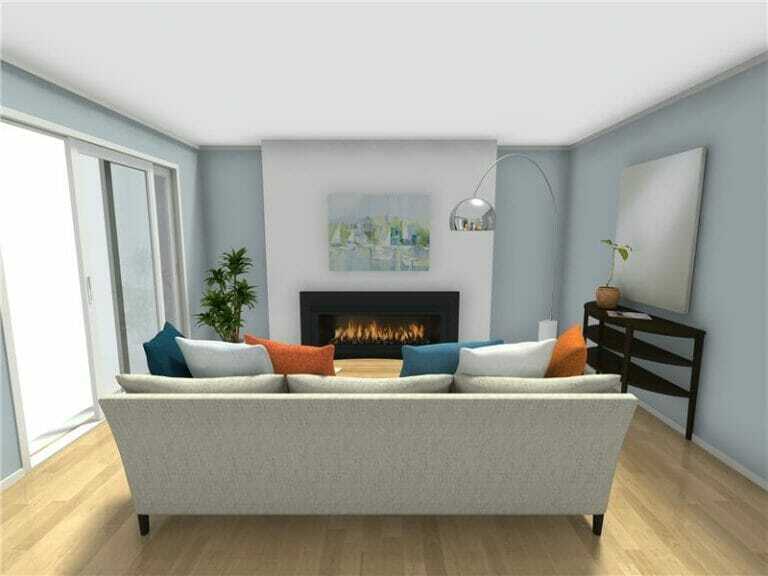 Upgrade key snapshots at the click of a button to create stunning realistic 3D Photos that “Wow” clients with a true visualization of their interior design. 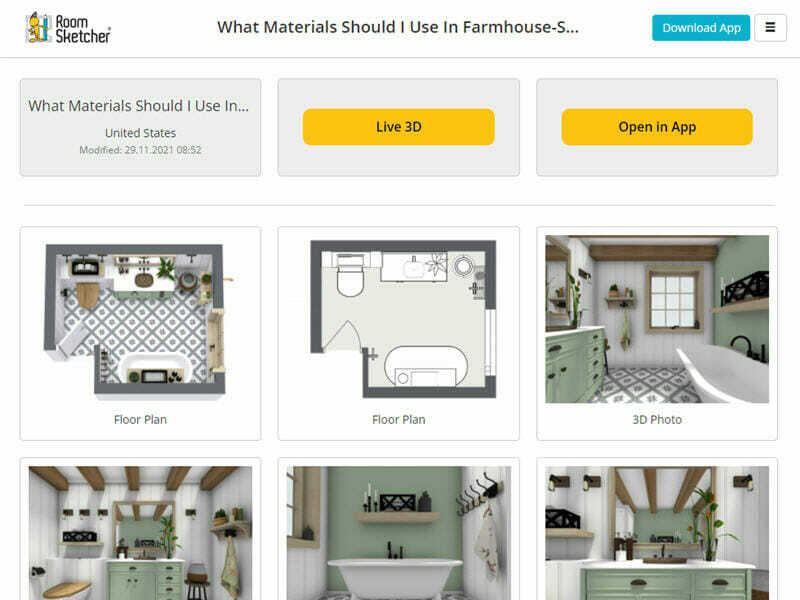 In addition, you can enable your floor plans with Live 3D to allow your clients to take a virtual tour of their home design as if they are actually there. The RoomSketcher interactive viewing technology also brings your designs and presentations to life with Panoramic Home360 views. Every RoomSketcher project comes with an online Project Presentation feature. The Project Presentation is generated instantly- no need to download images or spend extensive amounts of time formatting. The Project Presentation allows you to have your floor plans and images readily available and accessible online. Say goodbye to assembling presentation boards and lugging them all over town! Present your 2D and 3D Floor Plans, 3D Photos, Panoramic Home360 and even furniture selections from the Product Library effortlessly. Activate Share Live 3D Floor Plans on the project to instantly make Live 3D and Home Designer part of your presentation. Design meetings are essential and valuable for both designers and clients. The time is also expensive for both parties. Therefore it’s important that your design presentations are engaging, dynamic and productive. Improve your design communication with RoomSketcher high-quality 3D visualization and interactivity. Use the Project Presentation to present a professional and interactive visualization of your design proposal. Click the Start Home Designer button to open the project to make changes and view different options dynamically. Then update your project presentation at the click of a button with RoomSketcher instant correction and fast premium rendering. Make your meeting time more productive, with the immediate results clients love! No time to meet? The online Project Presentation makes it easy to review design projects remotely. Just send your clients the Project Presentation link so you can review it together over the phone or allow them to review the presentation on their own when time allows. Reduce expensive meeting time and the response time on important project feedback. With a RoomSketcher Free account, you can try out RoomSketcher Home Designer at no cost. When you’re ready for Live 3D and to generate high-quality 2D and 3D Floor Plans and 3D Photos, simply upgrade your account to a RoomSketcher Pro subscription. It’s that easy!